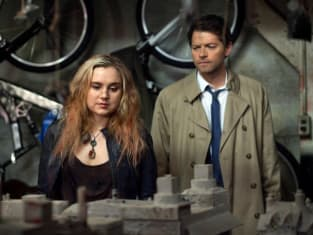 We’ve been missing him for too many Supernatural episodes - but we finally get Castiel back in this week’s "Goodbye Stranger." 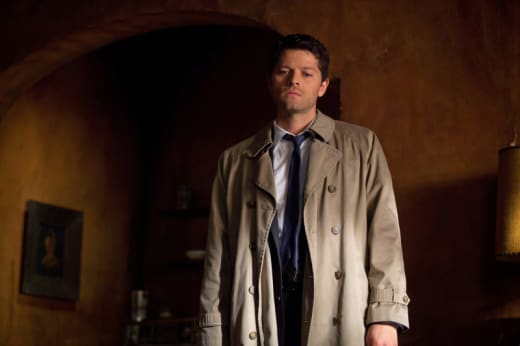 TV Fanatic: I love Castiel’s entrances on the show. Sometimes very simple but sometimes more fun and big. Does he have a fun entrance into this week’s episode? Misha Collins: Yes, I think a lot of people will find Cass’s reveal in this episode not fun. Or maybe let’s not use that term. Let’s say it’s dramatic. TVF: We haven’t seen him for awhile. Do we find out where he’s been since the last time we saw him? MC: Yes. Cass has been undergoing sort of Manchurian Candidate-style training by Naomi. His programming is complete at the offset of this episode. The monster is finished. TVF: Will we then see a different Cass than he was the last time he appeared? MC: Yes, it’s going to be a more…when he goes into programmed automaton mode, we will really see him almost zombie-like. But the Cass that we see in between when he’s not specifically under Naomi’s control is a little bit more subtle. I think he’s supposed to appear to Sam and Dean to be more or less normal. They get a sense that there’s something off with him but it’s not like he has a clear and complete character reversal. TVF: The fact that Cass is in this state, should Sam and Dean trust him or question him? MC: They shouldn’t trust him and they don’t trust him and Cass knows they don’t trust him. It’s an open secret. They’re all agreeing to work together in this episode because they have a shared interest. TVF: Do we get a sense of what Castiel’s objective is or is it a mystery? I’m guessing he has his own objective different from Sam and Dean’s. MC: He does and his objective is unknown to us at the outset but is revealed half-way through the episode so we find out what he’s really after. TVF: I know Cass and Dean end up going off together in search of Lucifer’s Crypt. Can we expect some fun banter between the two of them? MC: Yes. I think fun is the wrong word. I think this time the interaction between Cass and Dean is very heightened and dramatic. But, yes, there will be interaction of substance. TVF: I kinda feel like sometimes Dean is too cranky. I mean he’s pretty but he can be so cranky! MC: I know! A good looking guy like that could just be smug about his handsomeness and enjoy that for a change but, no. They do manage to stay pretty good-looking. There really should be a hell of a lot more disfiguring scar tissue on both Sam and Dean given what they’ve been to. In any given episode they get so badly beaten up that they would probably have some permanent life-long disability from that. TVF: Does Naomi ever think that Cass should have a different coat other than that trench coat? MC: I think so! I don’t know about Cass. I don’t know whether he reflects on that much but I would love that. It’s a fairly frumpy and not terribly well-tailored trench coat that he wears. I’m sure he could find something cooler. TVF: What are you excited for fans to see in tomorrow night’s episode? What will knock their socks off? MC: The final confrontation between Cass and Dean that happens in this episode is pretty good stuff. TVF: Would you use the word game changer? MC: [Long and pregnant pause] Yes. I would. TVF: I like that big pause. Thank you for that. MC: I don’t know if you can say that long and pregnant pause in written form but, yes, it’s definitely a game changer. TVF: I will actually just write in italics long and pregnant pause. TVF: And how is fatherhood treating you? MC: I am enjoying building forts with my son. I think that I actually stopped developing emotionally and intellectually around two myself.